Family Separations, Guns and Elections: How Do Texas Voters Really Feel? In the latest edition of the UT/TT Poll, Texas voters weigh in on some of the nation’s most contentious issues — border detention centers, school shootings, NAFTA — and offer insight into the upcoming elections. In the latest edition of the University of Texas/Texas Tribune Poll, Texas voters weigh in on some of the nation’s most contentious issues — border detention centers, school shootings, NAFTA — and offer insight into the upcoming November elections. 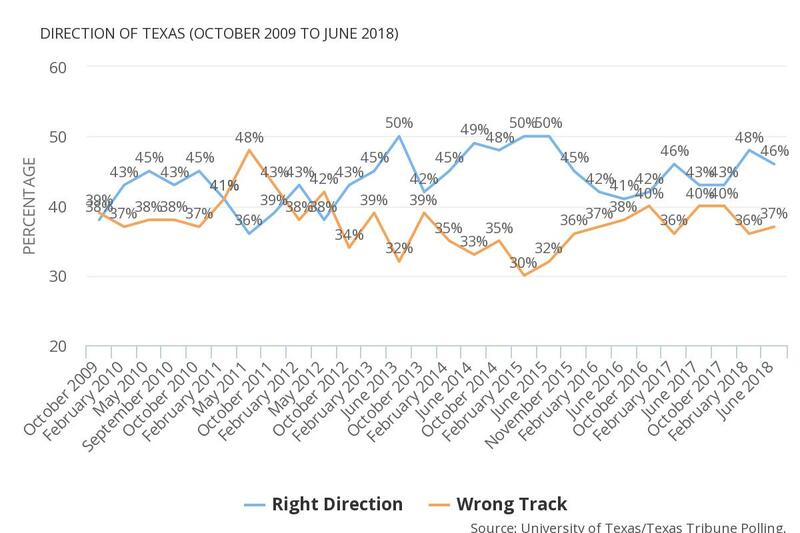 The University of Texas/Texas Tribune survey of 1,200 registered voters was conducted from June 8 to June 17 and has an overall margin of error of +/- 2.83 percentage points. An overview of the latest findings and how they compare with prior polls is detailed below. A slim plurality of Texans say that the North American Free Trade Agreement (NAFTA) has been good for the Texas economy, while a larger majority disapproves of separating children and parents apprehended while crossing the U.S.-Mexico border. Results showed that 34 percent believe NAFTA has been good for the Texas economy, while 28 percent said it has been bad. The poll revealed increasingly wide partisan differences between Republicans and Democrats. 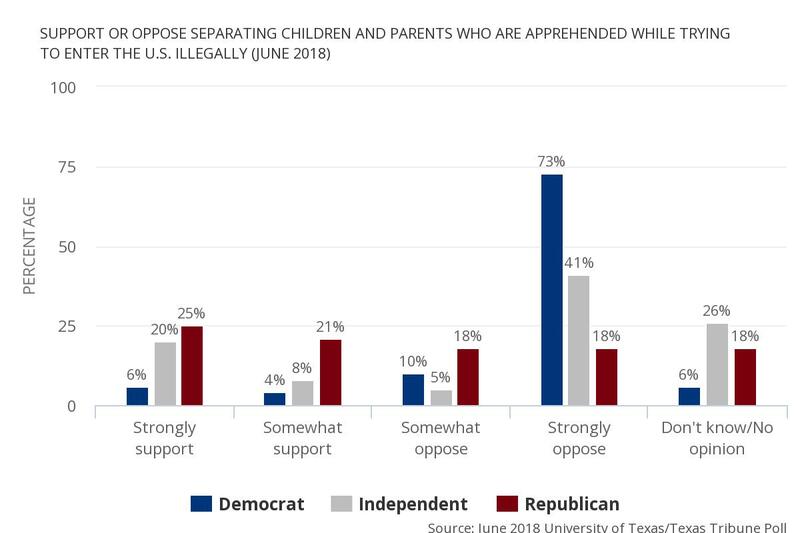 The poll also found a clear majority of Texans, 57 percent, opposed to the policy of separating children from their parents if they are apprehended while attempting to enter the U.S. illegally. Conversely, 28 percent supported the practice, with 15 percent saying they didn’t have an opinion. The poll was conducted as the situation on the border received national attention, but data collection was completed before President Donald Trump signed an executive order to end that aspect of his “zero tolerance” policy on the border with Mexico. Despite the recent school shooting in Santa Fe, Texas, attitudes toward guns and gun-related laws remained largely unchanged from the results of a UT/TT poll in November 2017. Asked about the strictness of Texas gun laws, 51 percent said they should be made stricter, 13 percent said they should be less strict, and 31 percent said they should be left alone. 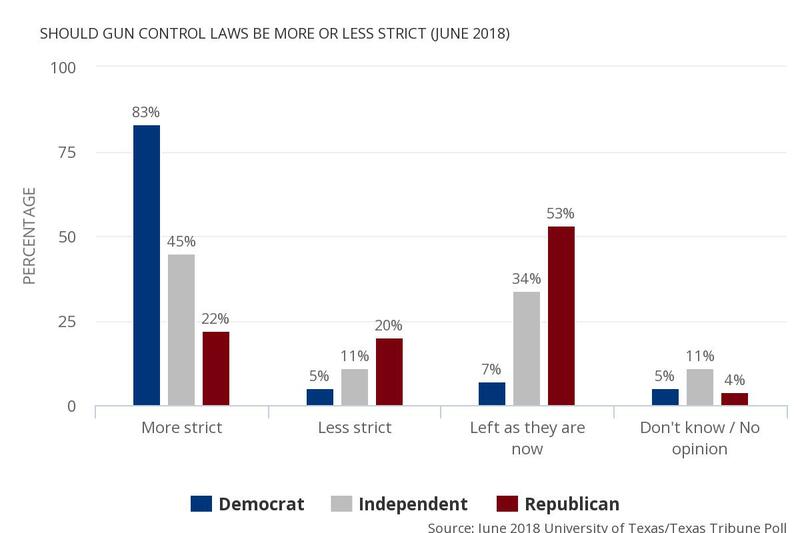 Similarly, Texans were divided in their beliefs about the causes of school shootings, with stark differences between Democrats and Republicans. Asked which factor is most to blame, the top response among Democrats was “insufficient restrictions on gun ownership” (34 percent). Among Republicans, the top responses were “poor parenting” (26 percent) and “bullying” (14 percent). Sixty-five percent of Texans continue to support the death penalty, while 25 percent oppose it. This represents a 10 percent decrease in support from the last time the UT/TT poll asked about the subject in February 2015. Most of the declining support in that period can be attributed to Democrats. Although early voting for the fall elections remains four months away, the poll provides an early reading of preferences in the top statewide races. Sen. Ted Cruz (R) holds a 5-point advantage over Rep. Beto O’Rourke (D), despite O’Rourke’s fundraising and earned media prowess. Gov. Greg Abbott (R) maintains a 12-point lead over former Dallas County Sheriff Lupe Valdez (D). Lt. Gov. Dan Patrick (R) holds a 6-point lead over Mike Collier (D). Attorney General Ken Paxton (R) finds himself in the tightest race among those tested at this early stage, with a slim 1-point lead over Justin Nelson (D).